As if the unattractive yellowish-orange tint that lawn rust gives your turf weren’t bad enough, this fungus also weakens and thins out your grass. While lawn rust might look like a serious disease, it isn’t hard to get rid of. Taking steps to improve the overall health of your lawn is often enough to clear up the problem. Lawn rust is the common name for a type of fungus, usually the Puccinia or Uromyces species, that grows most frequently on Kentucky bluegrass and perennial ryegrass. Because it thrives in warm, humid conditions with intermittent bright sunlight, it usually shows up in late summer or early autumn, particularly during wet years. Any time the grass stays damp for 6 hours or longer, lawn rust can take hold. Before you start trying to get rid of lawn rust, make sure that’s actually what you’re dealing with. The gentle approach required for this fungus doesn’t always help with other types of lawn diseases and damage. 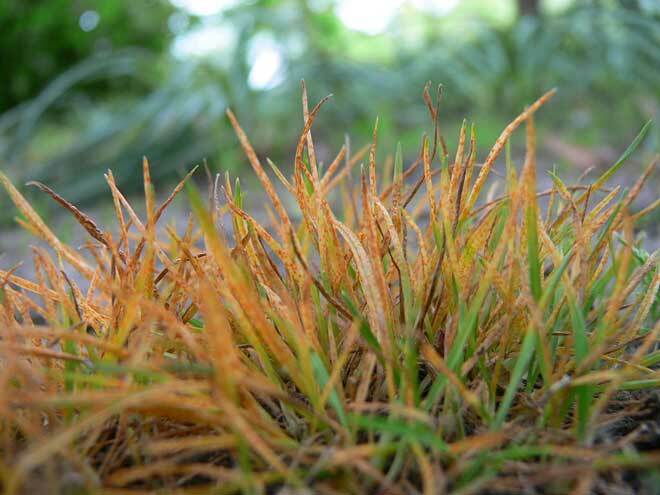 If lawn rust is your problem, you’ll notice certain common symptoms. Areas of your lawn have taken on a sickly color ranging from yellowed green to orange-red or brown. The discoloration is more or less evenly distributed with undefined edges, rather than concentrated in distinct patches. In affected areas, the grass coverage is thin and the blades break easily, but the grass isn’t dying off completely. Individual grass blades are coated with a powdery orange-red to yellowish brown dust that you can rub off with your fingers. This is where the fungus gets its “rust” name. You might also find this dust clinging to your shoes or clothes after you walk through the lawn. If the lawn has been affected for several weeks, you might find small pustules that have broken through the surfaces of the grass blades. These start off orange, but turn black as winter approaches. Lawn rust forms almost exclusively when the grass is in a period of slow growth, so anything that interferes with your lawn’s normal, healthy growth puts it at risk for this fungus. While there’s not much you can do about the weather, there are plenty of other ways to optimize your lawn’s growing conditions. Nourish your lawn – Throughout the growing season, feed your lawn small amounts of slow-release nitrogen fertilizer every six weeks. Just 0.2 to 0.5 pounds of nitrogen per 1,000 square feet is generally enough. Pay special attention to fungus-prone areas, such as shady spots. Steer clear of high nitrogen fertilizers in the fall. Too much growth toward the end of the season leaves grass vulnerable to other problems, such as Fusarium patch and red thread disease. Water in the morning – Good watering practices protect your lawn from the damaging effects of heat stress without leaving it damp and prone to fungal infections. Watering your lawn in the cooler hours of the early morning gives the grass a chance to dry out during the day. Avoid watering in the evening because it creates the ideal wet, cool conditions for lawn rust fungus to grow and release spores. Give your grass around 1 to 1 1/2 inch of water per week or enough to keep the soil soaked 6 inches deep. Water two or three times a week, rather than daily, so the lawn’s surface can dry between watering. Mow regularly – Keep your lawn at around 1 1/2 inches, mowing when it hits 2 1/4 to 3 1/2 inches. When you’re done, rake up the grass clippings or use a lawn sweeper. Regular mowing and raking removes fungus-affected grass, making your lawn look better and preventing the fungus from spreading. Rinse your lawn equipment after using it on areas of lawn rust. Improve air circulation – Poor air circulation helps fungal spores form. To get more air to your grass, use a thatching rake to break up any thatch more than 1/2 inch deep, then remove the thatch with a leaf rake. Use an aerator to reduce soil compaction so water and fertilizer can reach your lawn’s roots more effectively. Trees or shrubs that hang low over the lawn should be trimmed back, so they don’t block airflow. Because improving your lawn’s health is typically enough to get rid of lawn rust, applying fungicide isn’t generally recommended. Lawn rust won’t kill your grass, and even if you can’t get rid of it this season, your lawn will still be able to produce healthy grass by next summer. What’s more, the fungicides that work best on lawn rust, DMI (DeMethylation inhibitor) and QoI (strobilurin), are usually available only to landscaping professionals. If you decide to go the chemical route, though, fungicide should be used only on a well established lawn and only after your other lawn care efforts have failed. Apply the fungicide before the lawn goes dormant for the winter. Most lawn rust infections clear up with just one treatment. Newly seeded lawns are an exception. For these, apply fungicide at the first sign of lawn rust to prevent the fungus from taking hold. When the conditions for it are just right, lawn rust can make frequent appearances. If you live in a climate with cool springs and warm, bright early summers or you have a shady lawn in heavy clay, you might find this orange blight showing up every year. In this situation, it’s reasonable to apply a fungicide to keep the fungus under control. A professional gardener or landscaper can advise you on the best type for your lawn. A lawn rust infection might look dire, but it won’t cause permanent damage, and it’s usually easy to get rid of. In most cases, you can restore your lawn to health by applying modest amounts of fertilizer, watering and mowing on the right schedule, and aerating carefully. When that doesn’t work, fungicide can help.